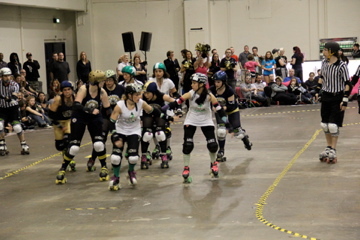 The London Roller Derby season kicked of last Saturday in South West London. The Ultraviolent Femmes and the Harbour Grudges delivered an exciting bout with suspense until the last minutes. The teams were on fire, the crowd ecstatic and those new to the sport quickly got into the action. Whether it is the dress (golden hot pants, colourful bits of hair & make up. All with a refreshing touch of individualism), the adrenaline wavering through the venue or simply the revelation of watching women on quads skates play a full body contact sport that leads to being hooked at first sight is unclear. The fact is though, that all of the above are a unique mix and most definitely worth checking out. No, that’s not true, Roller Derby is not worth checking out, it MUST be checked out. By anyone who has ever stood on half a skate, spins around Hyde Park or simply loves Starlight Express. No matter how you roll you need to go see this as it is without a doubt the most exciting thing in the world of eight wheels! It doesn’t take long to get a hang of the sport and understand what the witty commentators are on about when they announce lead jammer, talk about pack tactics and get hyped up about power jams. And it takes even less time to get into the spirit of the bout and cheer on the ladies on wheels. It is simply impossible to escape the punk-rock appeal mixed with a family-friendly (!) environment, tipped of with clever and intelligent humour. A word of warning at this point: Roller Derby might quickly turn from being intrigued to being thoroughly obsessed. All the fans (well established and brand new alike) find it hard to stay away once they had their first whiff of sweaty padding. Skatefresh is now most definitely part of the fan base! The whole scene is charmingly DIY so the girls truly are involved from head to wheels. They organise the events, take care to the admin, scout for fresh meat and support one another. This is nothing if not fantastically, amazingly, super, mega, incredible…. and all of that. Skatefresh is looking forward to collaborating with the London Rollergirls on the odd occasion and will be there at the next bout!